Introduction to the Search function in Social Intranet where you can find out everything without accessing each specific application. 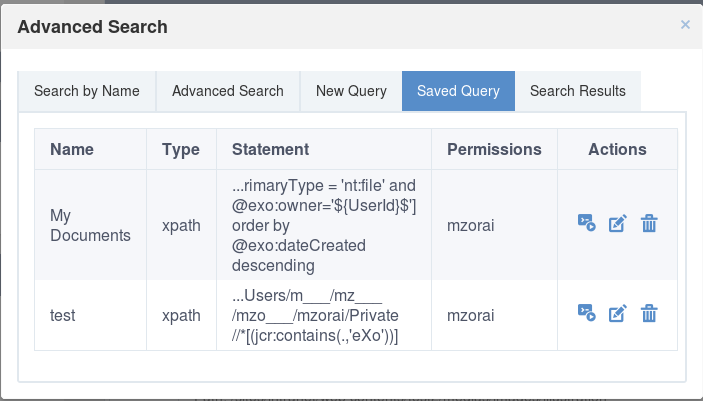 Details of searches that allow you to search for specific content types just within separate applications. How to further restrict the search scope to streamline the returned results. 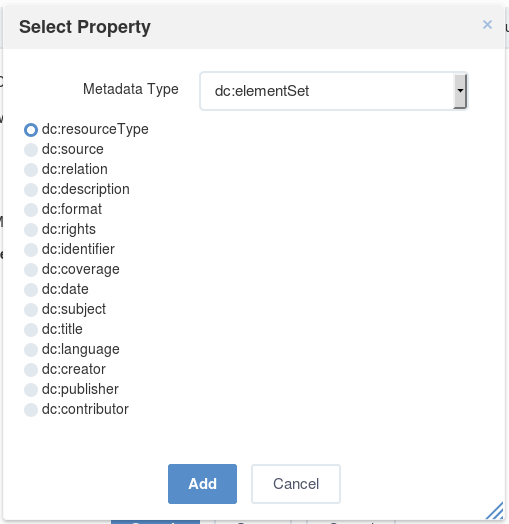 How to change settings for Search portlets and manage content types displayed in Search portlets. Besides the search feature in each application, PRODUCT provides a robust search tool which allows you to search for all types of content right in Social Intranet. With this new search feature, you are able to search for everything without accessing each specific application. This means the productivity will be much enhanced as you can search for any content at any location with just few clicks away from the search box on the navigation bar. Click on the top navigation bar to open the search box. Enter your search term into the Search box. This search displays quick results in the drop-down menu. These results are grouped by their types: Files, Documents, Wiki, Pages, Discussions, People, Spaces, Events, Tasks, Questions and Answers. By default, the quick search returns results for content located in the current site only. Select your desired result from the drop-down menu to directly access it; Or, hit the Enter key, or click , or click See All Search Results to view all results in the search main panel. After having the search results list that corresponds to the keyword used in the search box, you can preview an element from that list either in Documents Application or with the document viewer. It is also possible to download it. 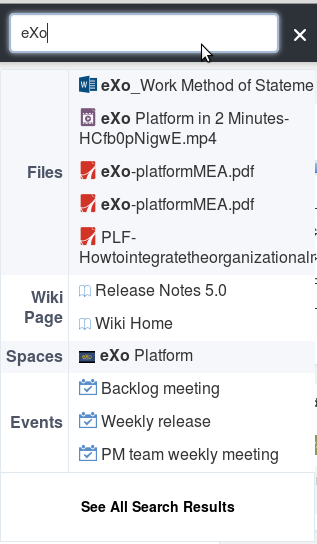 To preview the selected document in document viewer, you simply need to click on the document’s icon. To preview the selected document in Documents Application, you simply need to click on the document’s link or in the button Open in Documents after previewing it in document viewer. To download the selected document, you need to preview it with the document viewer then click on the Download button. 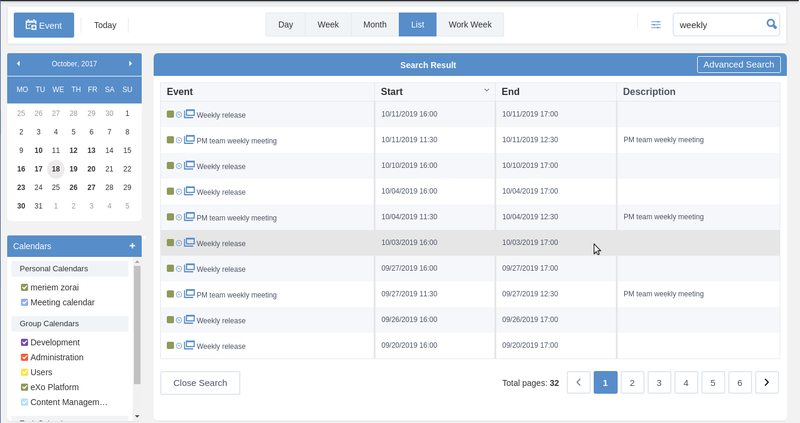 In the search main panel, you can further restrict the search scope to streamline the returned results. By selecting the Sort By drop-down menu, you can narrow your search results. Relevance: This type is set by default for search and in the descending order. This means the search results will be sorted by the connection with the entered terms. The top result is one which has the closest relevance with the entered term. Date: This type displays results by the last created/modified date in the descending order. Title: This type displays results by their title based on the ascending (alphanumeric) order. If you select each Sort option again, the order type will be changed. This means “ascending” is changed into “descending” and vice versa. 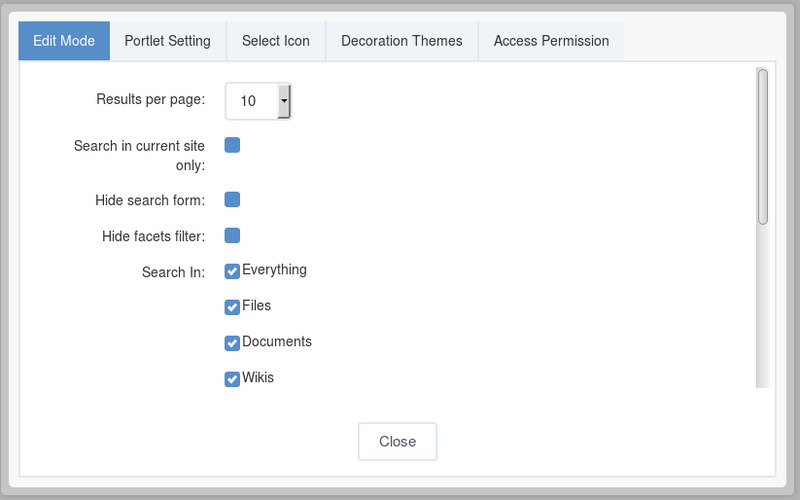 The Filter By panel is displayed on the left side, allowing you to control the search range by sites and content types. All Sites: A list of sites on which the search action is performed. All Content Types: A list of content types by which the search action is performed. By default, all checkboxes are ticked. To exclude some result types from the results page, simply untick the corresponding checkbox. 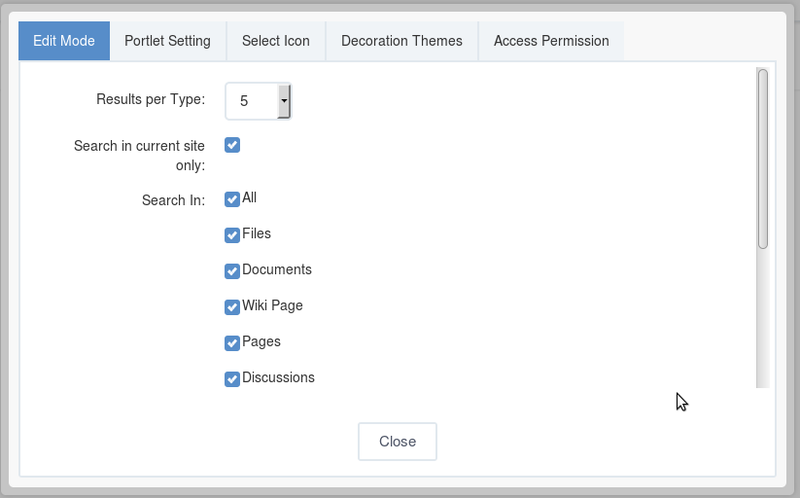 If you are an administrator, you can change settings for Search portlets and manage content types displayed in the Search portlets easily. There are 2 Search portlets you can customize their settings, including: Search main page and Search textbox. To change settings of the Search main page portlet, you have to go into its Edit mode. Open the Search main page by doing quick search. Select –> Page –> Edit Layout. The Page Editor is opened. 3. Hover your cursor over the Search portlet and select to open Search settings in the Edit Mode tab. Results per page Specifies the number of results that are retrieved each time a search is run. The value “10” is set by default. Search in current site only Scopes the search to the current site. If being checked, the All Sites filter is not displayed in the Filter By panel. Hide search form Hides the search field and search button. Hide facets filter Hides the whole Filter By panel. Search In Specifies the content types that the Search portlet must search in. Change the Search settings, then click Save Settings button and click Close to quit the form. Click to quit the Page Editor and back to the Search page. 1. Open the Page Editor, then drag and drop the Quick Search portlet (of the Search category) from Page Editor to the main page body. If you do not see the Quick Search portlet in the Page Editor, you need to import it as described in Importing portlets and gadgets. Hover your cursor over the Quick Search portlet and select to see the Quick Search settings in the Edit Mode mode. In which, “Results per Type” specifies the maximum number of results retrieved for each content type. The value “5” is set by default. Click here for more details about fields. Change the Quick Search settings, then click Save Settings and click Close to quit the form. Click to quit the Page Editor. 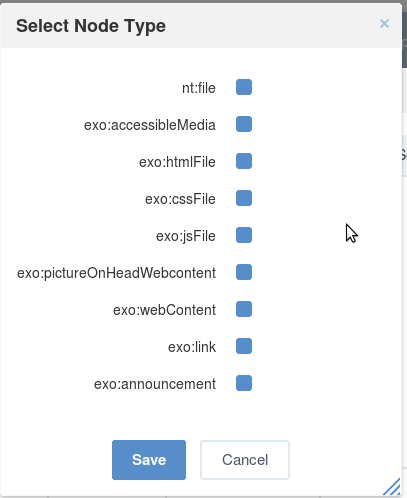 In eXo Platform, administrators can use the Search Administration page to enable or disable various content types on which your search is based. Content Type The type of searchable content. Description The quick description of each content type. Action The action to disable/enable each content type. When disabled, a content type will no longer appear in both search results and Search settings. Enable/Disable your desired content type by clicking the corresponding button in the Action column. Searching for spaces Steps to search for spaces by name/description or by alphabets. Searching for contacts Steps to search by name, position and skills, or by alphabets. Searching for documents Steps to do quick and advanced searches for your document. Searching for posts and topics Steps to do quick and advanced searches for posts and topics in Forums. Searching for Wiki pages Steps to search for Wiki pages. 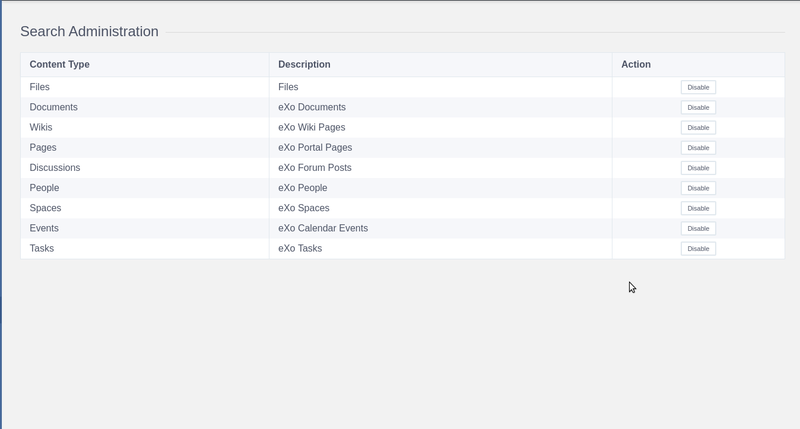 Searching for events/tasks Steps to perform quick and advanced searches for events in Calendar. 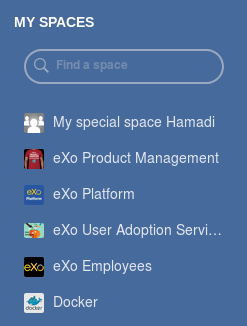 In the Social Intranet homepage, you can do a quick search for your desired space from the list of spaces where you are managers or members right in the MY SPACE panel. Or, you can search in the Spaces application that helps you easily find spaces from one of the tabs in the Space navigation. To do this, click the MY SPACES link, or click Join a space on the left panel to open the Spaces page first. After accessing your desired space tab, you can search for spaces by Name and Description from the Search textbox or by Alphabets. Enter your search key into the Find Space field. Only spaces where their names or descriptions contain the Search key will be listed in the Spaces Found panel. Simply click a specific letter. Only spaces where their names start with your selected alphabet are listed in the Spaces Found pane. Select People in the left panel to be redirected to the People Directory page. Here, you can see all users who are active in eXo Platform. Search by Name : Enter the contact name you want to search into the Search by Name field. When you type, a drop-down list of contact names containing your entered letter appears for you to select. Search by Position : Enter the position of the contacts you want to search by. Search by Skills : Enter the skill of the contacts you want to search by. Hit the Enter key, or click Search to find your desired contacts. If you filter by first letter , only contacts whose last names start with the search letter are returned. The search results are also arranged to the alphabetical order of last names. You can combine more than one search type (by name, by position and by skills) at the same time to enhance your search results. You can select a tab from the People Directory page to narrow the search scope. The search engine is tolerant to typos, meaning it can find results even if you searched with wrong accent or missed a letter in the name you’re looking for. With the quick search, you can directly type a search term in the search textbox. All documents, whose keywords are matched with the search term, are retrieved and listed in the results form. Enter a keyword into the search textbox. Click to perform your search; Or, press the Enter key. The search results will be displayed right in the main view. The search results are empty if no document contains the search keyword. Type Groups the content by its type together. The ascending order is set by default. By clicking Type, the order type will be changed into descending, and vice versa. Name Displays the document content which matches with your search term. 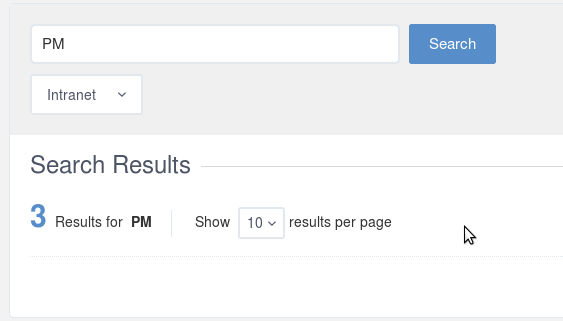 Score The appearance frequency of your search term in the content. The higher score is, the more your search term appears in the content. Or, click to go to the folder which contains the relevant document. 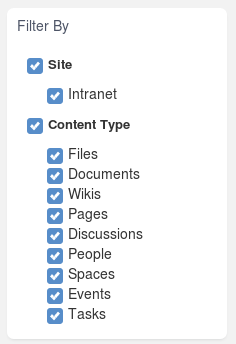 You can refine the search results by selecting one or many documents tags. Containing the used keyword for search. Tagged by the selected tags. Ensure that the sidebar is diplayed in left menu of the documents application, if not refer to this link to display it. Click to display all the used tags for documents. Select one or many tags to refine the search results. To be able to refine your search using tags, you should add tags when uploading/adding contents and files to the documents application, otherwise, the tag cloud will be empty. Click on the sidebar. To follow this way, you need to enable sidebar first. Click to open the Advanced Search form. Enter the exact name you wish to search in the Content Name field. Results will return with the message No results found if there is no content with the entered name. Results will be returned in the Search Results tab if the requested name is found. This search enables you to search with more constraints to limit the returned results. 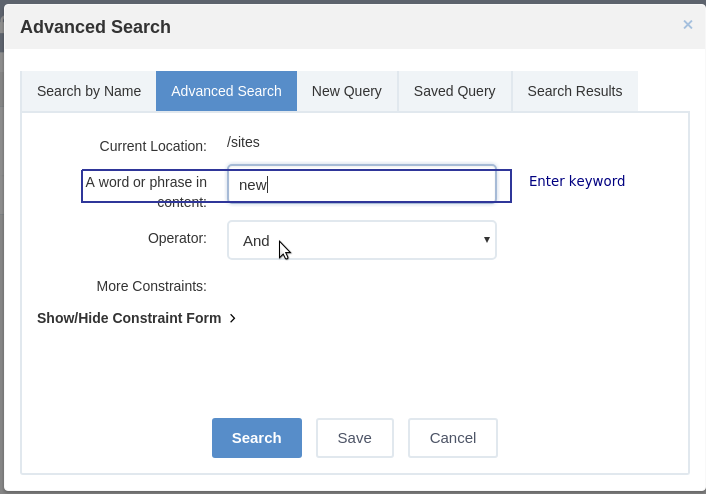 Extra search constraints are entered in the Advanced Search tab of the Advanced Search form. The Current location field is not editable. It shows the path selected to search. Enter search terms in the A word or phrase in content field. Select And operator to only return results that meet both the search terms and the entered constraints (see Step 3). Select Or operator to return results that meet either the search terms or the entered constraints (see Step 3). Click Show/Hide Constraint Form to add more constraints. A further constraint options window will appear. Adds more than one constraint with either of two operators (And and Or). Adds a constraint to search by a property with specific values. Adds a constraint to search by a property that contains one of the word in the keyword. Adds a constraint to search by a property that does not contain the keyword. Adds a constraint to search by a duration of date (created, modified). 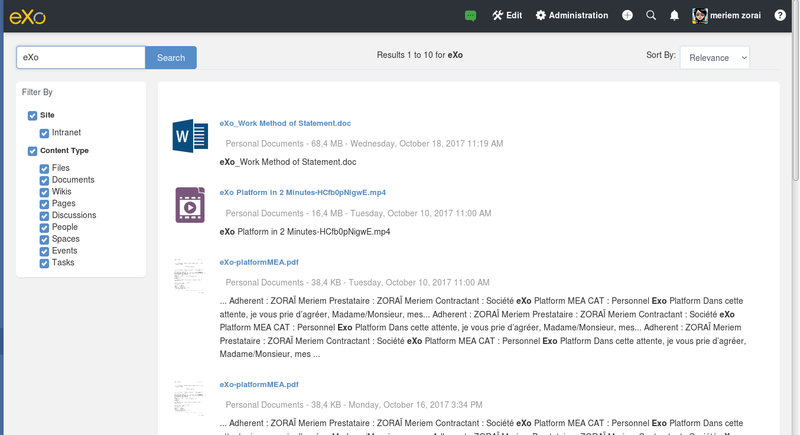 Adds a constraint to search by a document type, including File, Article, Podcast, Sample node, File Plan, Kofax. Adds a constraint to search by categories. Select the constraint operator (And/Or). Click Add to add any/all activated constraints. 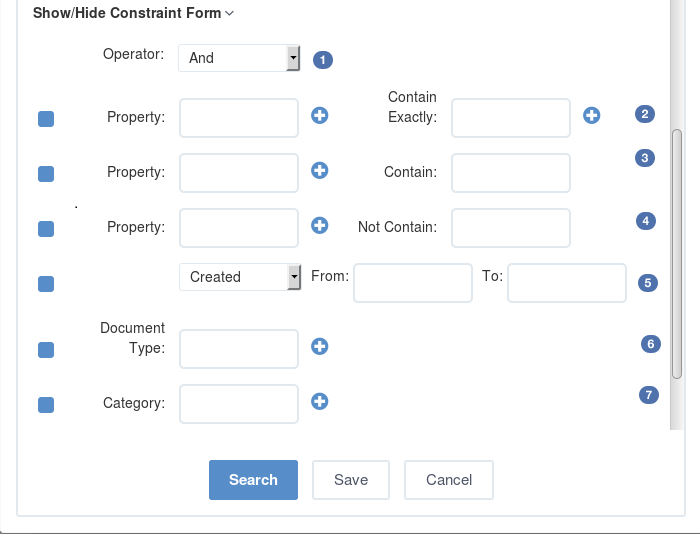 The constraints will be converted to an SQL query and displayed in the search form. Click Search to launch the search. Results will be displayed in the Search Results tab. 8. Click Save and put a name for this search configuration if you want to save it to use in future. The followings are methods to add the required constraints. Tick the checkbox that corresponds to the constraint you want. A list of possible properties appears. Select a property from the list and click Add. The selected property will populate the Property field. Define the property value to search for by entering a value into the Contain Exactly field, or click . The Filter Form with all pre-existing values for your selected property will appear. If the value you require is in the list, select it and click Select. If the value you require is not in the list, enter it in the Filter field and click . The value will populate the Contain Exactly field of the constraints form. Tick the checkbox corresponding to the Contain or Not Contain constraint, as appropriate. Enter the required property in the Property field, or click (refer to Step 2 in the Adding a constraint for exact values section for more information). Enter the required values in the Contain or Not Contain fields. Tick the checkbox beside the field with the drop-down menu (below the Property entries). Define the search condition from the drop-down list (Created/ Modified). A small calendar will appear. Select the date you want to use as a constraint. Repeat the above steps for the To field. The selected dates will populate the From and To fields in the Add constraint form. Tick the checkbox beside the Document Type field. Enter the document type you want to search, or click to open a list of document types. Tick the checkbox corresponding to your desired document type, then click Save. 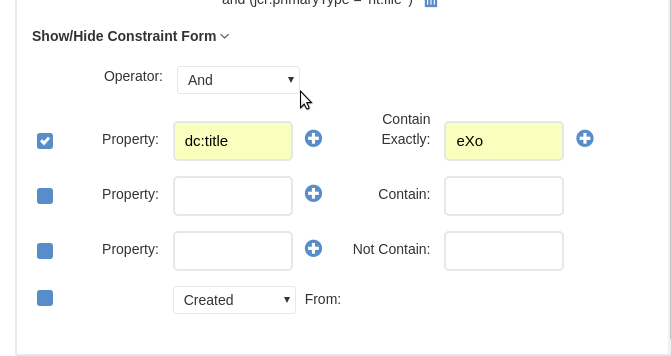 The selected document type will populate the Document Type field. Tick the checkbox beside the Category field. Enter the category you want to search, or click for a list of categories. Click that corresponds to your desired category. The selected category will populate the Category field. You need knowledge of the structure of query statements to configure a search using the parameters on the New Query tab. Enter a unique name for this query in the Name field. Select a query type from the drop-down menu: SQL or xPath. Click Search to perform the search and display the results in the Search Results tab; Or, click Save to save the search query to the Saved Query tab. This tab lists all saved search queries that you have access rights to use. Click to perform the search. You will see results in the Search Results tab. Click to edit the query statement. 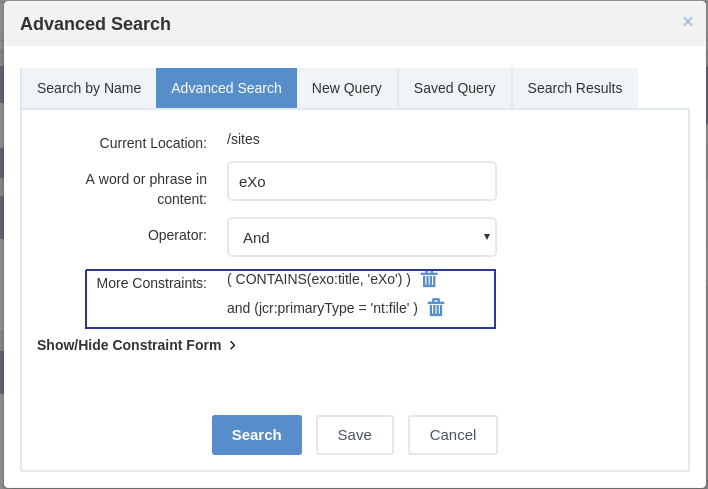 The query form will appear like when creating a query (see the Searching by creating a new query section); however, you cannot edit the name of the saved search. Click to delete a query (provided you have the access rights to that query). Click on the sidebar to see the list of existing queries. 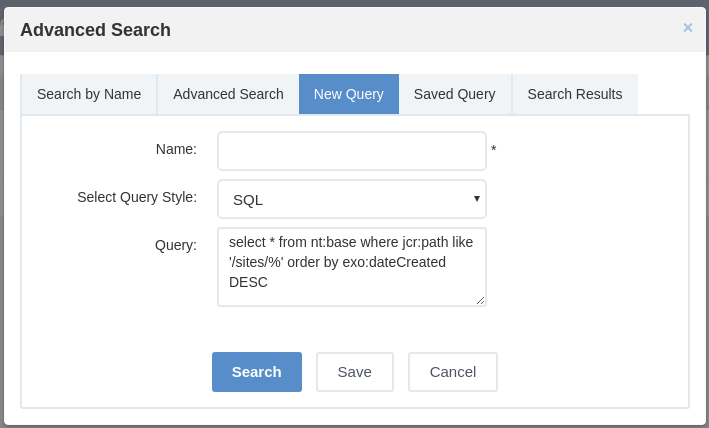 Launch, modify or delete the queries as required (see the Searching by creating a new query section for more information). Filter results with the entries in the All Items and/or Filter by Type panes on the left of the tab. Items matching the selections will appear in the right pane. Click to view the file or click to go to the file location. You can do a Quick Search or an Advanced Search anywhere in the Forums application, right on the homepage or inside each specific forum or topic that makes it easy to find the expected information. With Quick Search, users can directly type a search term in the textbox. All the categories, forums, topics and posts that have the keyword matching the search term will be quickly displayed in the Search Result form. The Search function on the main bar to search for items related to categories, forums, topics and posts. The Search function inside one specific forum to find topics and posts in the forum only. The Search function inside one specific topic to find posts related to the topic only. Enter a search term into the relevant search textbox. Click Search or press the Enter key to perform your search. Depending on your selected object, the results which contain the matching keyword will be displayed in the Search Result form. 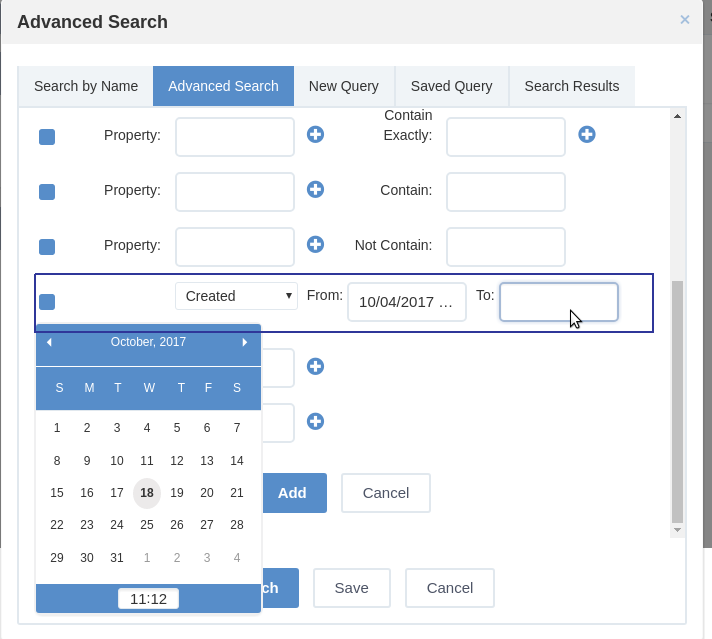 The Advanced Search allows users to make a search with particular criteria corresponding to the object you want to find. Or, click Advanced Search link in the forum/topic search pop-up. Based on the criteria you want to search, such as category, forum or post, the search criteria will be changed accordingly. Click Search to do search. Also, click Clear Fields to reset the inputted values. Matched results will be shown in the Search Result form. There will be an alert message when there is no object matching with the search criteria. Select Category from the Search in drop-down menu. Scope The search scale. With the “Full” option selected, returned results are those with both titles and content matching the keyword. With the “Title” option selected, returned results are those with titles matching the keyword. Username Filters search results by the category creator. Input the name manually, or click to select users from a specific group. Created between - and Filters search results by categories created within an interval. Moderator Filters search results by the category moderator. Input the name manually, or click to select users from a specific group. Select Forum from the Search in drop-down menu. Status The status of the forums (“Locked” or “Unlocked”). State The state of the forums (“Open” or “Closed”). Posts Filters search results by the minimum number of posts in the forum. Click and drag the slider bar to set the number of posts. Topics Filters search results by the minimum number of topics in the forum. Click and drag the slider bar to set the number of topics. Moderator Filters search results by the forum moderator. Input the name manually, or click to select users from a specific group. Select Topic from the Search in drop-down menu. Type The type of the topic specified by the topic type name and its icon. It can be selected from the existing list. Status The status of the topics (“Locked” or “Unlocked”). State The state of the topics (“Open” or “Closed”). Created between - and Filters search results by topics created within an interval. Last Post between - and Filters search results by the last post’s created date in the topic. Posts Filters search results by the minimum number of posts in the topic. Click and drag the slider bar to set the number of posts. 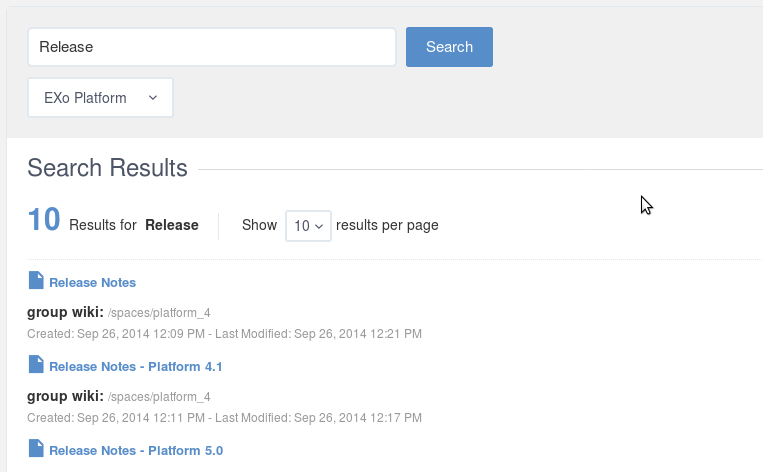 Views Filters search results by the minimum number of topic views. Click and drag the slider bar to set the number of views. Select Post from the Search in drop-down menu. Scope The scale for searching. With the “Full” option selected, returned results are those with both title and content matching the keyword. With the “Title” option selected, returned results are those with post titles matching the keyword. Username Filters search results by the posters’ usernames. Input the name manually, or click to select users from a specific group. Created between - and Filters search results by posts created within an interval. Enter a keyword into the search box. Select your desired page from the drop-down menu. You will be redirected to the selected page; Or, hit the Enter key to go to the result page. If you are in the portal wiki, your quick search will be performed on all wiki spaces, otherwise it will only be performed on the current wiki. Or, hit the Enter key to go to the result page. The search results are displayed like the illustration below. If there is no result matched with the keywords, the search screen informs no result for your search keywords. Optionally, you can change your search scope by selecting another location from the drop-down menu. This function allows finding existing events according to specific search conditions easily. There are 2 search types: Quick search and Advanced search. 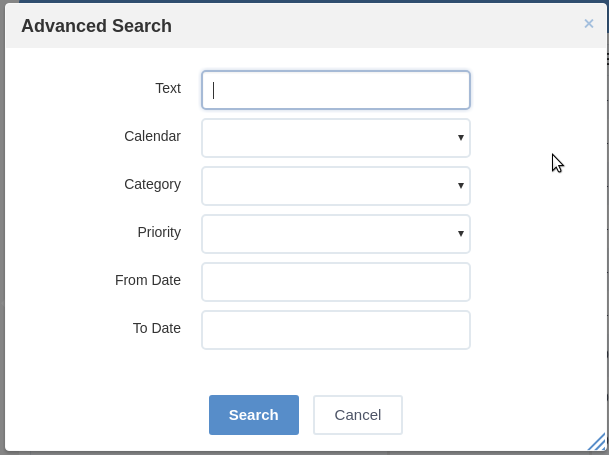 This function allows you to do a quick search with specific keywords in all your events/tasks. All events having the text matching with your search term will be returned. Enter a word in the Search field at the right corner of the toolbar. 2. Hit Enter key to perform the search. The matching events will be shown in the Search Result page. This function allows you to make a search with multiple criteria. Click Advanced Search on the Search Result page. Input your search criteria in the Advanced Search form. Text The search term or keyword for searching. Calendar The calendar on which you want to perform your search. Category The category of event to conduct your search. Priority The priority of your needed events: Normal, High or Low. If you leave blank in the field, your search will be done to all priority levels. From Date Only the events having ‘To date’ greater than or equal the date entered in the From Date field are listed in the results form. You can click this field and select a date from a mini calendar. To Date Only the events having ‘From date’ less than or equal to the date entered in the To date field are listed in the results form. 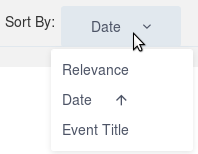 You can click this field and select a date from a mini calendar. Click Search to perform your search. All events matching with your criteria will be listed in the results form. In the Search Result form, you can click an event to view it, or edit/delete an event by clicking / at the bottom. If you are searching for a recurring event using Quick search, notice that the search returns those that occur in 2 years in the future. This limit is to prevent an infinite result, so it does notimpact non-recurrences. In Advanced search, if you leave the To Date field blank, the 2-year limit is also applied. So you can search for occurrences later than 2 years by filling in that field.